Dyke Howell ’63 had a significant impact on some of the nation’s most well-known infrastructure projects during a 30-year career in the industry, working on the Interstate 70 tunnels through Glenwood Canyon in Colorado, the Milwaukee Metro Sewerage Department’s North Shore Tunnel, and the elevator shaft for the new Hoover Dam visitor’s center, just to name a few. We asked Howell, co-founder of Frontier Constructors, which is now known as Frontier-Kemper Constructors, a few questions about his career and how he’s seen underground construction and tunneling develop over the last 50 years. Q: How did you get into the infrastructure industry? A: My father was an engineer with the Illinois Highway Department from about 1925 until World War II when he enlisted in the U. S. Army Corps of Engineers. After the war, he joined with two other highway department and WWII vets to form a construction company specializing in highway and bridge work, mostly in southern Illinois. My summers in late high school and while at Mines were spent working in various capacities on his highway projects. 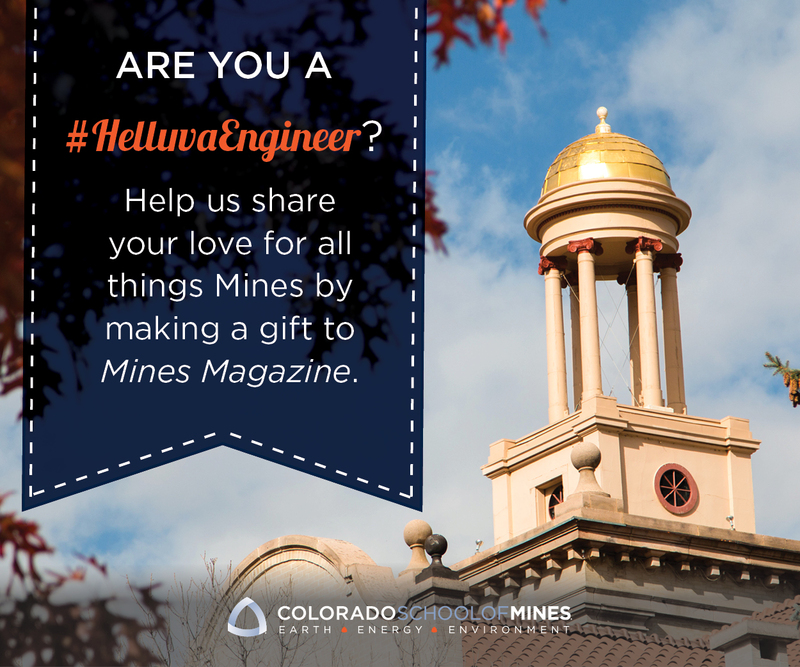 My original major at Mines was geophysics, but in my senior year, I decided to focus on the construction industry and changed my major to mining, the closest thing to civil engineering offered at Mines at that time. This necessitated a second senior year and I graduated in the summer of 1963 after completing mine surveying. Dan McFadden was a classmate and fraternity brother who had graduated in January 1963 and had taken a job with Patrick Harrison Inc. at the suggestion of Gerry Harrison, another Mines classmate and Patrick Harrison’s son. At that time, Patrick Harrison was one of the largest Canadian mine development contractors and specialized in shaft sinking and underground excavation. When I graduated, Gerry also recommended that I apply to their U.S. company, PH Inc. I did and was hired. After two years of field experience in Kentucky, Arkansas and in the home office in Colorado, Dan and I decided to form our own company. Frontier Constructors Inc. was incorporated Aug. 19, 1965. We had a pickup truck, about $500 cash and a lot of ambition. Proximity to the Federal Center in Lakewood gave us easy access to the Bureau of Reclamation, Forest Service, National Park Service, etc. I spent many hours tramping their halls in search of bidding opportunities for small projects that we could bond and perform. Early jobs included small bridges, pipelines, a fish hatchery, a 4-hole outhouse, flume reconstruction after the 1965 South Platte flood, and exploration drilling and all jobs were won by competitive bidding. We always wanted to focus on underground work and our first such project was the construction of an elevator shaft at Jewel Cave National Monument near Custer, South Dakota. Our second underground job was an “exploration” tunnel that became the Vidler Water Tunnel under the Continental Divide between the Horseshoe Basin on the Western Slope and the abandoned mining town of Waldorf on the Eastern Slope above Georgetown. As the projects grew in size, we formed a joint venture with Kemper Construction from Culver City, California and eventually merged the two companies to form FKCI. Q: As co-founder of Frontier Constructors, now Frontier-Kemper Constructors, you were involved in one of Colorado’s most game-changing transportation projects – the Hanging Lake Tunnels on Interstate 70 through Glenwood Canyon. What were the biggest challenges you faced? A: The biggest challenges we faced on this project were administrative, not physical. In order to prequalify to bid the job we had to demonstrate a certain level of experience and proficiency with the New Austrian Tunneling Method, or NATM. We had done several major civil projects with Traylor Brothers Inc. of Evansville, Indiana, and had agreed to pursue Hanging Lake as a joint venture. In 1979 Deilmann Haniel, GmbH from Dortmund, Germany purschased a 40 percent interest in FKCI. Neither FKCI nor Traylor had the requisite NATM experience, so we brought in a Deilmann Haniel subsidiary, Beton und Monierbau from Austria and a pioneer in NATM as a 10-percent partner in the JV. This satisfied the Colorado highway department and we were allowed to bid. The other administrative challenges were satisfying the “social engineering” requirements of the job. This involved finding and recruiting adequate participation by minority subcontractors and women in the workforce. My role in this project was in the background as President and CEO of FKCI. I oversaw the estimating and bidding process and approved the final bid, but the heavy lifting was done by another Mines grad, Denis McInerny ‘67, who was project manager with all on-site management responsibility. Q: What other major projects stand out from your career? A: From the inception of the Frontier-Kemper JV in 1972 until my retirement in 1995, the company performed approximately 160 projects. The majority of these were mine development jobs involving shaft sinking, raise drilling and various types of tunneling. 1977 Morton Salt Company mine replacement project, Weeks Island, Louisiana: Existing underground Morton salt mine, built around 1900, was taken by the government for oil storage as part of the strategic petroleum reserve and we won the contract to sink two shafts 1,400 VF deep using ground freezing in the top 175 VF and to excavate 500,000 cubic yards of salt as the initial mine development about 500 VF below the oil storage level. 1977 Monterey Coal Co., Carlinville, Illinois: Two raise drilled shafts, 325 VF, drilled to 20’3”-diameter in a single pass. The world’s first 20 foot-plus-diameter raise drilled shafts, a record at that time. 1985 Hoover Dam, Arizona and Nevada: U.S. Bureau of Reclamation removal of 50 LF of concrete lining in both 45 degree-inclined spillway tunnels and re-lining with eccentric shaped “aeration slots” to prevent damage to the lower concrete lining by cavitation during spillway usage due to flooding. 1986 Milwaukee Metro Sewerage Department North Shore Tunnel: JV with Traylor Bros., 28,220 LF of 30-foot-diameter rock tunnel, excavated in rock by TBM and fully concrete lined. 1987 Waste Isolation Pilot Plant Project (WIPP), Carlsbad, New Mexico: U. S. Department. of Energy, construction of 20’3”-diameter raise drilled shaft 2,150 VF. The largest raise drilled shaft ever constructed at that time. 1989 Hanging Lake Tunnels, Glenwood Canyon, Colorado: JV with Traylor Bros. and Beton und Monierbau, FKCI sponsored. Twin highway tunnels conventionally excavated (NATM method) and concrete lined. The last link on I-70. 1990 Trans-Koolau highway tunnels, Oahu, Hawaii: JV with Traylor Bros., Beton und Monierbaum and E.E. Black, FKCI sponsored, Twin highway tunnels each about 3,300 LF by 48 FT by 38 FT, concrete lined. 1990 Elevator shaft, Hoover Dam: Elevator shaft for the new visitor’s center constructed by the first U.S. use of a “V-Mole,” a vertical shaft boring machine from Germany. The shaft is 20 feet in diameter by 570 VF deep. 1993 Westside Light Rail System, Portland, Oregon: JV with Traylor. Bros., FKCI sponsored, twin 3-mile rail tunnels constructed with both hard rock TBM and drill and blast methods between Portland and Beaverton, Oregon. with one vent shaft and two elevator shafts, 270 VF, with underground station providing access to the Portland Zoo. 1994 Subway tunnels, Los Angeles, California:, JV with Traylor Bros., twin subway tunnels, TBM excavated and concrete lined plus various cross passages and ancillary station work. Q: Tunneling and underground construction are growing in popularity as urban areas continue to densify. How have you seen that industry change? A: In the period of my involvement, basically from 1965 through 1995, I observed a decrease in metal mining activity, primarily in the West, and a surge in coal mine construction from about 1970 through about 1985. There appeared to be a growing demand for uranium, which offered the promise of jobs for our kind of work, until the Three Mile Island accident in 1979. Indeed, the probability of deep uranium mine shafts requiring ground freezing was a motivating factor in Deilmann-Haniel’s purchase of FKCI shares. They never materialized. Our focus changed from mining to civil works (infrastructure) in 1986. I saw many projects, of ever increasing size, caused by a lot of factors. DOE mandates for clean water led to many major projects like Chicago’s TARP (Tunnel and Reservoir Project) and Milwaukee’s CSO (Combined Sewer Overflow) abatement systems, each with many large individual contracts for shafts and tunnels. As the cities become more and more congested and surface real estate becomes more valuable, more transportation is pushed underground. I have no doubt that as the population increases, there will be an increasing demand for underground infrastructure development. This will inevitably mean that projects will be built in increasingly difficult environments requiring more innovative and sophisticated machines and methods. We were considered pioneers in my working lifetime, rolling the dice and investing in large-diameter raise drilling equipment, developing ground freezing techniques and equipment, utilizing foreign machinery like the “V-Mole” and large road headers, slip forming watertight shaft liners, using pneumatic material transport equipment to remove raise drill cuttings from mines to prevent disruption to the mining operation and increase our market share in this discipline. Continued innovation is needed, but the industry is competitive. I am glad to see that Mines is leading the way in trying to improve the technology of not only excavation and material handling equipment, but of the accuracy of prediction of geological conditions which proceed the planning of new work. Disputes are common in this industry, and usually involve actual or alleged “differing site conditions” and often lead to costly and time consuming litigation – much to the delight of the lawyers and usually to the dismay of both the contractor and the owner. Taking the guesswork out of the process prior to the bid is an absolute necessity. Q: What advice would you give to Mines students and graduates looking to pursue a career in the infrastructure industry? A: Do not get used to the laboratory environment – research is fine and is needed, but it must be coupled with practical experience. I believe that you will learn more on your first day of work in the “real world” than in all your days in the classroom. Your classroom work only prepares you to understand what you encounter in the field. It gives you a great background for problem solving, which you will find is expected of you more than you realize, especially if you are involved in mining or construction. Try to get jobs in your preferred area during your summer breaks. Don’t be afraid to get dirty, because it is dirty work. And if you go into construction, expect to travel a lot…from job to job, and seldom where you want to be. Don’t forget that profit is not a dirty word. It is the only thing that keeps a contractor in business. Bonding companies only care about your solvency – they are not your gambling partners – but they are an essential part of your business. Well spoken and truthful words from a pioneer and pillar of the industry.